Setting up a 7.5ft x 10ft Tension Fabric Straight Series in just 13 mins by myself. In this video, I will highlight on the details on how to manage and install tension fabric display system. Tension Fabric is the latest backdrop system and the most popular display system in the world now. The structure made of aluminium and fabric printed with sub-laminated method. Without any joining at the middle of your visual and it's able to have nice vibrant colors. Display System That You Never Seen Before..
Good Idea! Setting booth at the most cost effective method. We use the printed tarpaulin to wrap the shell scheme booth as backdrop. By using just double side tape. This I would said is the most cost effective method yet look fantastic. For more details, you ma login to our website https://www.bannerboy2u.com/product/exhibition-backdrop-setup-shell-scheme-backdrop-setup-exhibit-backdrop-booth-wrapping/ or give us a call @ 0389412116 , 0123579787 to share with us your next exibition plan. Kami menggunakan tarpaulin yang dicetak untuk membungkus gerai skema shell sebagai latar belakang. Dengan menggunakan hanya pita sisi ganda. Ini yang saya katakan adalah kaedah yang paling kos efektif namun kelihatan hebat. 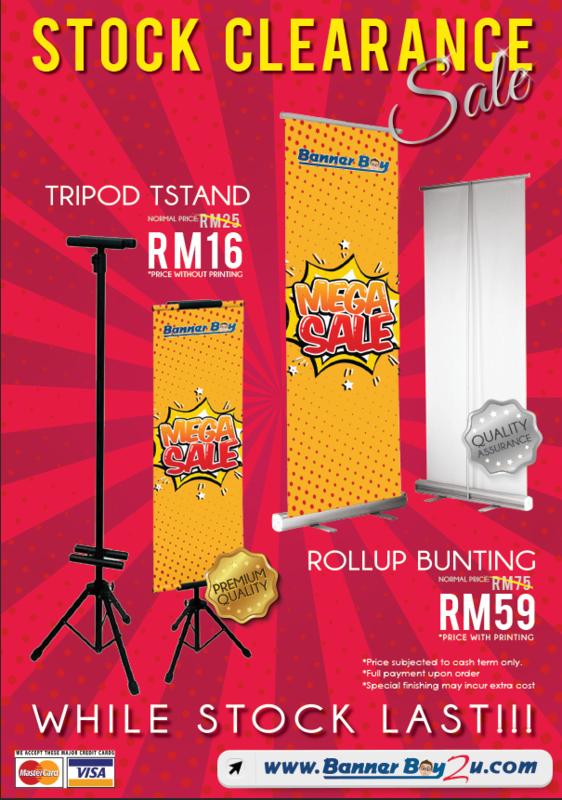 Untuk maklumat lanjut, anda boleh log masuk ke laman web https://www.bannerboy2u.com/product/exhibition-backdrop-setup-shell-scheme-backdrop-setup-exhibit-backdrop-booth-wrapping/ atau hubungi kami @ 0389412116, 0123579787 untuk berkongsi dengan kami pelan pameran berikutnya. 40ft long backdrop in 1 piece. No Joining. - Tension Fabric. Cara yang paling mudah untuk setting up latar belakang event anda. The process of making your custom artwork into frame wrap by high quality printing and art canvas material. 通过高品质的印刷和艺术帆布材料将您的自定义艺术品制作成框架包装的过程。.Proses membuat karya seni tersuai anda menjadi bungkus bingkai dengan percetakan berkualiti tinggi dan bahan kanvas seni. Latest advertising method, put your advertising on your car to have a mobile advertising at lowest cost, flexibility, smart, effective. Get your car advertisement today. 最新的广告方式，将您的广告放在您的汽车上，以最低的成本，灵活性，智能，有效的方式进行移动广告。 立即获取您的汽车广告。Kaedah pengiklananterkini, letakkan iklan anda di kereta anda untuk mempunyai pengiklanan mudah alih dengan biaya yang paling rendah, fleksibiliti, pintar, berkesan. Dapatkan iklan kereta anda hari ini. Material: Premium Car Wrapping Sticker with outdoor premium gloss lamination. Good News!! Crazy promotion for August.. You don't wanna to miss this golden opportunity..
Amazing branding promotion. 3D board will make your product more outstanding and attractive to cunsumer. Customer will pay more attention to your products when you promote in the shop and mall. 惊人的品牌推广。 3D板将使您的产品更加出色，对cunsumer更具吸引力。当您在商店和商场推广时，客户将更加关注您的产品。 Promosi jenama penjenamaan. Papan 3D akan menjadikan produk anda lebih berprestij dan menarik kepada pelanggan. 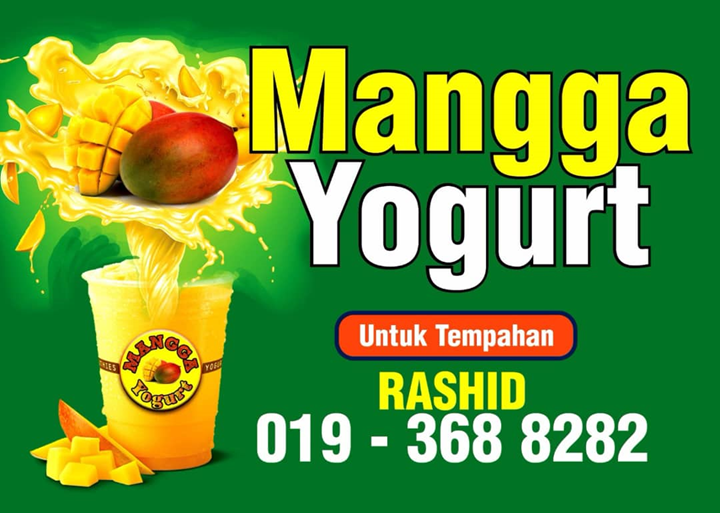 Pelanggan akan memberi lebih perhatian kepada produk anda apabila anda mempromosikan di kedai dan pusat membeli-belah. 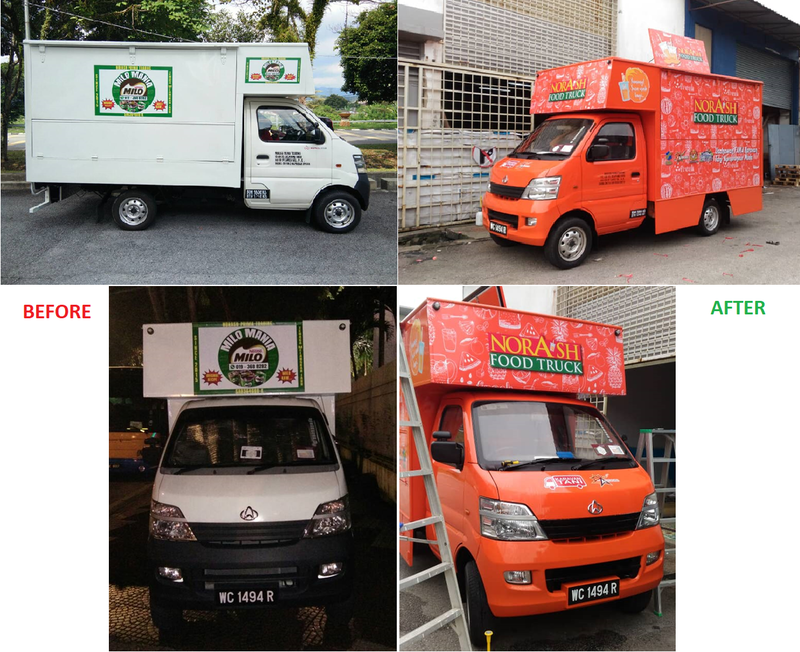 Fama Food Truck Rebranding, for better sales! Re-branding include design, painting and sticker in 1 week. We custom made mobile food truck with the highest quality and innovative of design. Services inclusive of refurbishing, remodeling and designing a brand new custom made food truck. With your own custom-made food truck, you are hip, distinctive and flexible! We use superior quality of products, tools and techniques to deliver the most excellent quality of result to you. Thank you to Lembaga Pemasaran Pertanian Persekutuan (FAMA). Working happily with food truck owner and fama! Lets change your food truck to look WOW. With us, you can rest assured that you have found the perfect company that will provide you with your desired results. Highest quality of services and products is a guaranteed deal with us. Trust us and we promise not to let you down! Hi, you had seen and purchase plenty of rollup bunting. Do you know how it’s made? Now we are showing you the production of “Rollup Bunting”. Give us a Like!. We will post more interesting videos soon. Stay tuned! Tension Fabric are the TOP HIT exhibition display in 2018!! 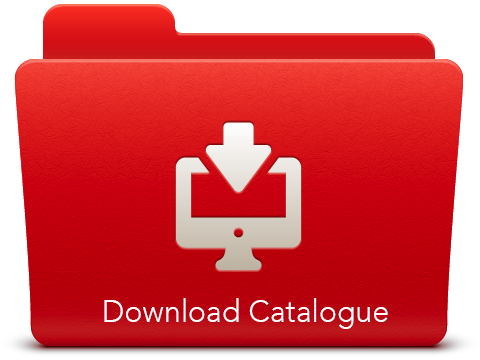 Download our Catalog Now. We hope to clear certain misconceptions and questions readers may have regarding Hari Raya Puasa. It’s Hari Raya Puasa today! Our Muslim friends must be busy preparing a scrumptious and mouth-watering feast of Lontong, Ayam Masak Merah, Beef Rendang, Ketupat and Kueh. Yum! But, apart from the delectable dishes Malaysian get to taste during the joyful occasion, how much do we all really know about Hari Raya Puasa? Here are 8 things that we should all know about the festival to join in the celebrations with our Muslim friends and neighbours. Why is Hari Raya Puasa celebrated? Hari Raya Puasa marks the end of a month of fasting for Muslims. It is a day of joyous celebrations. Some think that Hari Raya Puasa is the Muslim New Year but that is not true! Just what exactly does ‘Ramadan’ mean? Ramadan, the ninth month of the Islamic calendar, is a month of fasting for Muslims. During fasting, Muslims refrain from eating, drinking, smoking and sexual activities from dawn till dusk. Ramadan is considered a very auspicious month in the Islamic calendar as it is believed that Prophet Mohammed received the first verses of the Qur’an during this month. Muslims fast to appreciate what God has bestowed upon them. Through fasting, they believe that one learns self-control and develops empathy towards what the poor undergo on a daily basis. Fasting is an important religious duty in Islam. Hari Raya Puasa marks the end of the holy month of Ramadan and is day of gratitude and celebrations. What’s the difference between Hari Raya Puasa and Hari Raya Haji? While Hari Raya Puasa is a day for celebrating the end of the fasting month, Hari Raya Haji, which occurs usually about three months later, marks the end of the pilgrimage (Haj) Muslims make to the holy city of Mecca. Hari Raya Haji is also widely referred to as the ‘day of sacrifice’ as Muslims believe that on this day, Prophet Ibrahim almost sacrificed his son, Ismail, in an act of obedience and reverence to God. Muslims usually slaughter sheep and cows and feed the poor in remembrance of the Prophet’s sacrifice. Families wear traditional clothes on the day of Hari Raya Puasa. What happens on the day of Hari Raya Puasa? Muslims wake up early, visit the mosque and thank God for the blessings they have in life. They also seek forgiveness from their elders and receive ‘green’ packets of money. While dressed in their best, people visit family and friends and dig into delicious food! “It feels amazing when I put a morsel of Ayam Masak Merah in my mouth! 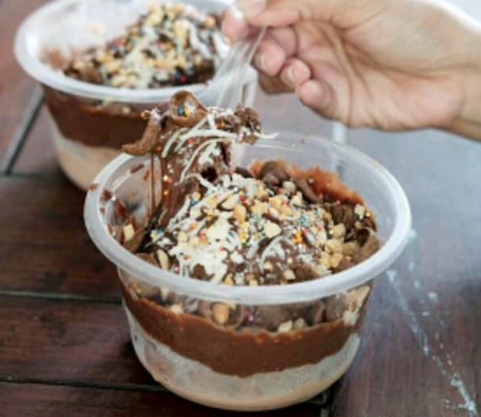 It feels like the entire month of fasting was sooo worth it!” exclaims Nisa Jumat, 24 – student. What are the traditional clothes, worn on the day, called? You look out the window on the day of Hari Raya Puasa and see brightly clothed people flagging a cab down. You try and tell your other half what these beautifully tailored clothes are but can’t get the names right..
Let us tell you. Women usually either wear a Baju Kurong, Baju Kebaya or Jubah. Men wear the male version of a Baju Kurong together with a Kain Samping (a piece of cloth worn over the trouser of the Baju Kurong). It is common to see men wear a songkok on their heads as well. It doesn’t really matter if you wear a Kebaya or Kurong – it is a matter of preference. Find out what to expect when you visit your Muslim friends during Hari Raya. How should guests generally behave? Most Muslims in Singapore do not expect guests to present gifts or cash. If guests insist on presenting something, then sweets, cookies or kueh are best and will be appreciated by most hosts! Guests should also look out for what not to give. Black is an avoidable colour. Wine, champagne or any other form of alcohol is an absolute no. Additionally, non-Muslim guests are not expected to be dressed in traditional Malay clothes. However, it might please your hosts, if you made the effort. Don’t have the time to shop for a Baju Kebaya or Jubah? Fret not! Wearing casual Western clothing is completely acceptable! However, keep in mind that the Muslim community here is quite modest. So female readers, remember not to wear anything too revealing! If you’re not too sure about the dress code, just keep in mind that short skirts and cleavage baring tops are a no-no! Before you dig into the yummy food, be sure to wish your friends ‘Selamat Hari Raya’. What are the most common Hari Raya Puasa greetings? Selamat Hari Raya is the traditional greeting used by Malay Muslims which means ‘Happy Hari Raya’ and ‘Maaf Zahir dan Batin’ which when translated loosely, means ‘ I seek forgiveness from you’. A lot of Muslims also say ‘Eid Mubarak’ when they greet each other; the term has Arabic origins. ‘Eid Mubarak’ means ‘Happy Hari Raya’. What else can you do to soak in the festive atmosphere? Bear in mind that a lot of festivities happen during the days leading up to Hari Raya Puasa. The bazaars held at Masjid Jamid are usually filled with rows and rows of stalls selling Hari Raya goodies, costume jewellery and outfits. We wish everyone in Malaysia, especially our Muslims friends, Selamat Hari Raya! 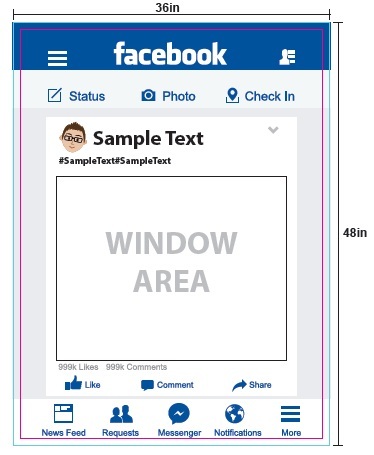 Download FREE Editable Facebook Social Media Photobooth Frame Template.. Step 1: Double click the PDF file to open. Step 3: Saved It! and you're DONE!! 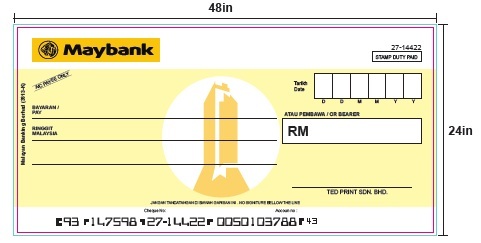 Maybank Mockup Cheque (48″ x 24″). See our latest promotion here. Photobooth Props Facebook Photo Frame (48″ x 36″). See our latest promotion here. 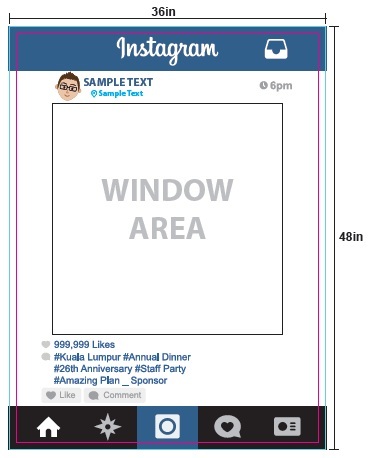 Photobooth Props Instagram Photo Frame (48″ x 36″). See our latest promotion here.